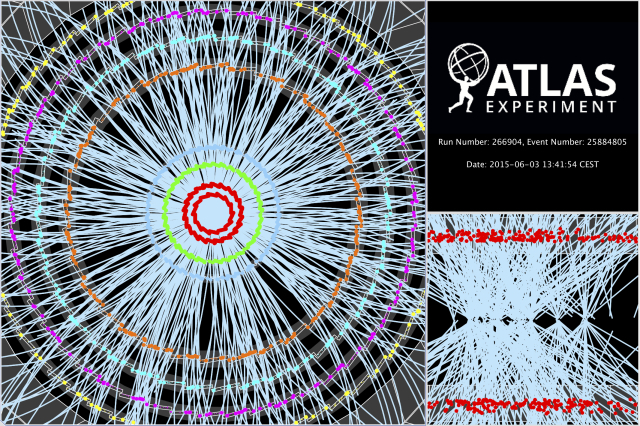 Display of a proton-proton collision event recorded by ATLAS on 3 June 2015, with the first LHC stable beams at a collision energy of 13 TeV. After a shutdown of more than two years, Run 2 of the Large Hadron Collider (LHC) is restarting at a centre-of-mass energy of 13 TeV for proton–proton collisions and increased luminosity. This new phase will allow the LHC experiments to explore nature and probe the physical laws governing it at scales never reached before. In this first long shutdown, during which the LHC was consolidated, the ATLAS experiment saw a flurry of activity ranging from upgrades and repairs of the detector, its electronics and the trigger system, to a reappraisal of the computing and software used for the data reconstruction and analysis. ATLAS physicists have also used the time without beam to finalise and improve their analyses of the Run-1 data. In spite of the small relative amount of data collected, only 1% of the total dataset expected for the entire LHC programme, the data recorded by ATLAS with collision energies up to 8 TeV have provided a wealth of physics results and led to more than four hundred scientific publications. The expectations were high for this unique experimental endeavour represented by the LHC and its ultra-sophisticated particle detectors of which ATLAS is the largest one. The tera (1012) electron-Volt energy scale to which the LHC collisions of high-energetic protons are sensitive was sought to reveal new particles or phenomenon related to the mechanism that gives mass to elementary particles. The most anticipated and acclaimed scenario, and key prediction of the Standard Model, was the Brout-Englert-Higgs mechanism that predicted a spin-zero Higgs boson with a mass in reach of the LHC. Such a boson was discovered in 2012 by the ATLAS and CMS experiments successfully culminating decades of experimental and theoretical effort. This discovery, and a plethora of other important results pushing the frontier of our knowledge, made the LHC Run-1 an astounding success. The new data, initially produced at 60% higher collision energy and promising to be several times more abundant than before, have the potential to dramatically extend the results from Run-1. What’s next? It doesn’t take long, when ambling the corridors along the ATLAS offices at CERN, to realise the suspense that reigns among the physicists running the experiment and preparing the analysis of the first Run-2 collisions. The new data, initially produced at 60% higher collision energy and promising to be several times more abundant than before, have the potential to dramatically extend the results from Run-1. The Higgs boson properties will be measured to much better precision, and new production and decay channels may be observed, further revealing the nature of this particle. Higgs physics will continue to be at the heart of Run-2, but the new data will also allow ATLAS to measure Standard Model processes at unprecedented energies and level of accuracy at hadron colliders, and detect yet unobserved rare processes. High-precision measurements of the masses and couplings of the heaviest known particles, are particularly important as they are indirectly sensitive to new phenomena entering the observed particle reactions through so-called virtual processes. These measurements, however, are challenging and will take time to complete. Yet the excitement felt in the ATLAS offices is due to another virtue of the higher collision energy in Run-2: the possibility of directly creating new, heavy particles in the most energetic proton–proton collisions owing to the proportionality relation between energy and mass. There are several reasons to conjecture the existence of such particles. Among these is dark matter, a phenomenon believed to involve physics beyond the Standard Model. Dark matter, if it couples to the known particles, could be produced at the LHC and detected by ATLAS in events with an apparent energy imbalance due to energy taken away by invisible (dark matter) particles. These particles could have any mass and couplings, and we neither know whether the LHC can produce them, nor whether the experiments can detect them, even if they existed. Another motivation for new phenomena beyond the Standard Model lies in an apparent shortcoming of the Higgs mechanism itself. Unlike matter particles, which by virtue of an underlying symmetry appear naturally light with respect to the extremely high energies that are thought to have existed during the earliest moments of the big bang, spin-zero particles such as the Higgs boson in the Standard Model do not have such a protective symmetry. It thus appears unnatural that the Higgs boson is so much lighter than these early energy scales where new phenomena are expected to govern physical laws. A new symmetry, such as the so-called “supersymmetry”, could solve that problem. Other mechanisms exist; all have in common to introduce new particles of which some may be observable at the LHC, and these new particles could potentially play the role of dark matter as well. ATLAS physicists will therefore mine the new data to deeply and comprehensively search for new physics. The higher collision energy will help to rapidly surpass the sensitivity of the searches conducted during Run-1. Ample opportunities but also significant challenges are facing the experimentalists. Critical attention and patience are required for a precise understanding of the new data before drawing conclusions. ATLAS is ready for it.